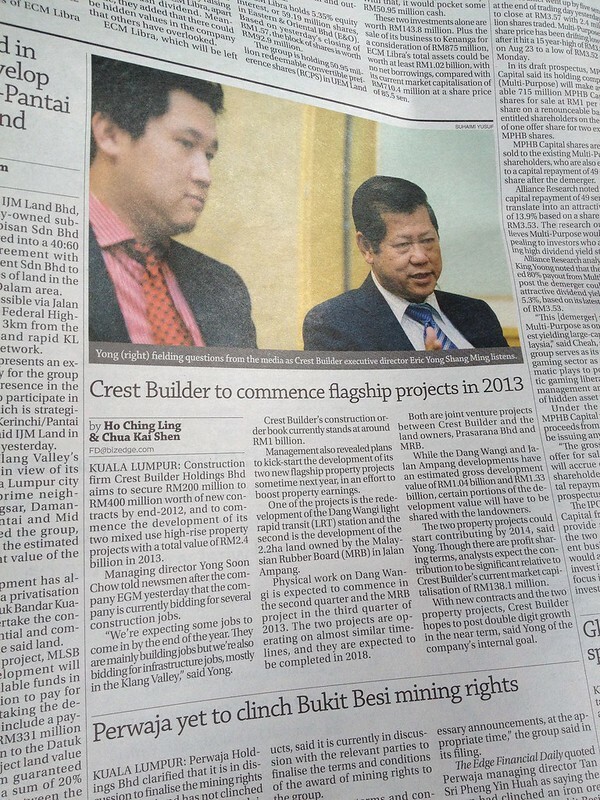 Crest Builder to commence flagship projects in 2013. KUALA LUMPUR: Construction firm Crest Builder Holdings Bhd aims to secure RM200 million to RM400 million worth of new contracts by end-2012, and to commence the development of its two mixed use high-rise property projects with a total value of RM2.4 billion in 2013. Managing director Yong Soon Chow told newsmen after the company EGM yesterday that the company is currently bidding for several construction jobs. “We’re expecting some jobs to come in by the end of the year. They are mainly building jobs but we’re also bidding for infrastructure jobs, mostly in the Klang Valley,” said Yong. Crest Builder’s construction order book currently stands at around RM1 billion. Management also revealed plans to kick-start the development of its two new flagship property projects sometime next year, in an effort to boost property earnings. One of the projects is the redevelopment of the Dang Wangi light rapid transit (LRT) station and the second is the development of the 2.2ha land owned by the Malaysian Rubber Board (MRB) in Jalan Ampang. Physical work on Dang Wangi is expected to commence in the second quarter and the MRB project in the third quarter of 2013. The two projects are operating on almost similar timelines, and they are expected to be completed in 2018. Both are joint venture projects between Crest Builder and the land owners, Prasarana Bhd and MRB. While the Dang Wangi and Jalan Ampang developments have an estimated gross development value of RM1.04 billion and RM1.33 billion, certain portions of the development value will have to be shared with the landowners. The two property projects could start contributing by 2014, said Yong. Though there are profit sharing terms, analysts expect the contribution to be significant relative to Crest Builder’s current market capitalisation of RM138.1 million. With new contracts and the two property projects, Crest Builder hopes to post double digit growth in the near term, said Yong of the company’s internal goal.